Wall Engineering provides the complete engineering design and project management for Residential and Commercial projects. Our designs include Land Planning, Roadway Design, Stormwater and Drainage, Water Systems, Wastewater Systems, Pump Stations, and much more. Our include all required calculations for permitting and construction services needed for compliance and project closeout with all municipalities and agencies. Wall Engineering specializes in Residential Structural Engineering Designs. We provide designs for custom and track homes in Horry County and surrounding areas. Our plans are detailed and always place an emphasis on quality while staying within the clients budget and time restraints. We also provide Foundation and Structural Reports for Residential and Manufactured Homes. 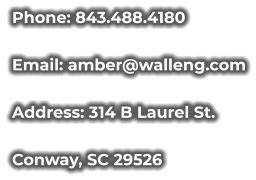 Wall Engineering provides state required Certified Erosion Prevention & Sediment Control Inspections for projects with a land disturbance permit. We also provide site assessments and other environmental services.